Slurps is the new naturally nutritious drink for dogs! Every dog owner worries about their dog’s food, but do they know how much their dog should be drinking? Two out of three dogs don’t drink the daily vet recommended 50ml/kg bodyweight. This runs the risk of serious dehydration and its related illnesses- Slurps has been developed specifically with this fact in mind. - Promoting healthy skin and coat – Omega-3 fatty acids help to improve the overall shine of the coat, as well as aiding to reduce skin inflammation which can be caused by allergies, fleas or scratching. - Supporting a healthy cardiovascular system – Omega-3 fatty acids aid in the reduction of cholesterol and triglycerides levels in the blood, promoting a healthy heart. - Boosting the immune system – all dog’s often benefit from a boost in their immune system, but none more so than senior pets. This is due to their immune system weakening over the years, leaving them more prone to infections and inflammation. The fish oils in Slurps come from small fish such as anchovies and sardines – which are a lot more sustainable than larger fish which take longer to grow. The concentrated formula is ideal to keep at home – simply add water and feed. The Ready-to-Drink format is great for taking on walks or whilst travelling. 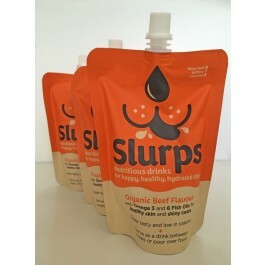 Slurps is also great for stimulating the appetites of dogs that are fussy, stressed or recovering from illnesses. Please Note:Slurps may be given to dogs with pancreatitis (due to the low-fat content – 2.15%), but it is advised to get advice from your vet before feeding to your dog. What are the benefits of using Slurps? What is in Beef Slurps? Nutritional Additives (Per 100ml):Omega-3 fatty acids 450mg, Omage-6 fatty acids 110mg, DHA 132mg, EPA 206mg, Energy 15Kcal. How do I use Slurps? Slurps has been used to pour over your dog’s food when administering medicines – Simply pour Slurps over the dog’s food (including the crushed up pills/liquids). Please Note: This pack makes up one standard 100ml portion so there shouldn’t be any leftovers, but if there are, refrigerate and use within 3 days.